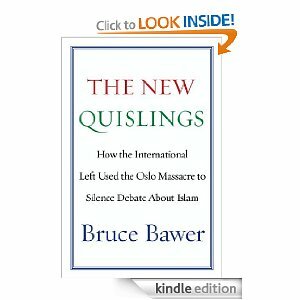 Bruce Bawer's new e-Book: The New Quislings: How the International Left Used the Oslo Massacre to Silence Debate About Islam is now available for sale. Need I tell you to buy this e-book immediately - I've got my copy downloaded on my iPad. Bruce Bawer is one of the most important intellectuals writing today. He's not only fearless, but he has first-hand experience with radical Islam. And, in this case, it's personal. Millions of people around the world were shocked and horrified when a madman named Anders Behring Breivik set off a bomb in downtown Oslo and then attacked a political summer camp on the island of Utoya, gunning down defenseless teenagers while calling out “Gotcha!” as though he were playing a video game. In the immediate aftermath of the attack, before the killer’s identity was known, some people leaped to the conclusion that this was yet another act of Islamic terrorism. When it turned out that the killer was a native Norwegian—the author of a rambling manifesto in which he described himself as a modern Knight Templar defending the values of Christian civilization—the left wing cultural elite in Europe and the US jumped to delegitimize critics of Islam by falsely and cynically linking them to Breivik. One of those critics was American writer Bruce Bawer, author of numerous books about the threat of Islamic radicalism and one of those whose works were cited in Breivik’s manifesto. Bawer has lived in Oslo for many years and has written extensively on the challenges of immigration and the negative effects of radical Islam on liberal societies. He is also a vocal critic of the left wing cultural elite that seeks to minimize this threat and promotes instead a vision of a harmonious multicultural society based on tolerance and mutual respect. Unfortunately, such “tolerance” does not extend to critics of Islam or multiculturalism, who are routinely labeled nativists and fascists by members of the left wing elite. The left typically denies or downplays the religious motives of Islamic terrorists while insisting that “right wing rhetoric” creates a “climate of hate” which necessarily leads to violence. Thus the multicultural left in Europe and the US strove to paint Breivik as a pro-Israel Christian terrorist whose insane actions were encouraged if not outright motivated by conservative authors who warn against the impending Islamization of Europe. Those who had criticized Islam, however legitimately concerned they might be with the denial of basic human rights and individual liberties within Muslim communities, were deemed officially anathema. They were Islamophobes—racists, bigots, extremists. They were the danger. They were the threat. They had fertilized the soil in which the mass murderer had grown. This campaign of vilification was waged not just in the European press but on American blogs and in the pages of the New York Times. In The New Quislings, Bruce Bawer explores the world-wide response to Breivik’s rampage, from the Norwegian cultural elite to Atlantic blogger Andrew Sullivan and the New York Times’ Roger Cohen. He provides a fascinating portrait of the left-wing cultural elite in Norway—revealed to be the birthplace of political correctness—and shows how they have become apologists for radical Islam. Bawer further argues that they are the heirs of Vidkun Quisling, the Norwegian fascist who administered Norway under the heel of the Nazi regime. And he explains how those who oppose open debate and seek to control the conversation about Islam pose the greatest threat to liberal society. Bruce Bawer Reviews our CBC Documentary! Acclaimed author Bruce Bawer reviews our documentary on the CBC: This Hour Could Have 10,000 Minutes: The Biases of the CBC. Cohen and Litwin don’t just take on CBC’s news programs. On the CBC, as they tell us (and show us), “even the game shows have a political bias.” On one such show, for example, contestants are asked: “Which city in Palestine is recognized to be a place of pilgrimage for Christians, Jews and Muslims?” Answer: Jerusalem. The CBC is, of course, also hostile to Canada’s own Conservative Party. The documentary showcases a shameless piece of trickery by the network, in which a clip of Conservative prime minister Stephen Harper is taken out of context to make it look as if he’s putting down Canada’s Muslim community. After showing us the CBC version of Harper’s statement, Cohen and Litwin present us with the uncut version, which makes it clear that Harper was making a respectful comment about both Jews and Muslims. On this occasion, too, the CBC was forced to apologize. The CBC bias against the Conservatives manifests itself on all kinds of shows and in all kinds of ways. In one clip, a weather girl makes snide remarks about Conservative policy. On a comedy show, an actor imitating Harper wishes viewers “a happy gun-toting, anti-abortion, heterosexual new year.” Another “comedy” program actually includes a sketch in which the actors shoot at Harper and George W. Bush. Skits mocking the left are few and far between. You can now buy our documentary through Paypal. If you want to order by Snailmail, then please visit our website for details. The Baedeker travel guide is now available in an environmentally-friendly version. The 200-page book, entitled "Germany - Discover Renewable Energy," lists the sights of the solar age: the solar café in Kirchzarten, the solar golf course in Bad Saulgau, the light tower in Solingen and the "Alster Sun" in Hamburg, possibly the largest solar boat in the world. The only thing that's missing at the moment is sunshine. For weeks now, the 1.1 million solar power systems in Germany have generated almost no electricity. The days are short, the weather is bad and the sky is overcast. Our DVD on the Biases of the CBC is now ready to be ordered. Included on the DVD are my opening comments from our event at the 2nd Annual Free Thinking Film Festival on November 13, 2011, the documentary (49 minutes) and our panel discussion about the film. Included on the panel are Brian Lilley from Sun News, Mike Fegelman from HonestReporting Canada, Stephen Taylor from the National Citizens Coalition, Eric Duhaime from Le Journal de Montreal, and David Krayden from the Canadian Centre for Policy Studies. To order our DVD, please send us a cheque for $22 (HST included) and $2 for postage to The Free Thinking Film Society, 39 Birch Avenue, Ottawa, Ontario K1k 3G5. The Free Thinking Film Society is a not-for-profit corporation and is 100% volunteer-driven. We pay no salaries to anybody. We also have a bonus DVD of extra clips about the CBC that will be sent out to anybody donating $50 or more to the Free Thinking Film Society. "This Hour Could Have 10,000 MInutes: The Biases of the CBC" covers CBC bias against Israel and against conservatives. Included on the documentary are my opening comments from our event at the 2nd Annual Free Thinking Film Festival on November 13, 2011, the documentary (49 minutes) and our panel discussion about the film. Is Anti-semitism moving to the mainstream?? ?